The file menu is where you can find the general options to open, save and print documents. You can find the File menu in the PDF Converter toolbar. You will also notice that this menu shows your current document's Properties, your purchased licence details and information about the software version. It's super easy to navigate your PDF documents once they're open in PDF Converter. Scroll through the document using your mouse wheel, or the scroll bar on the right. Use the Previous and Next buttons on the Home tab to jump to adjacent pages. 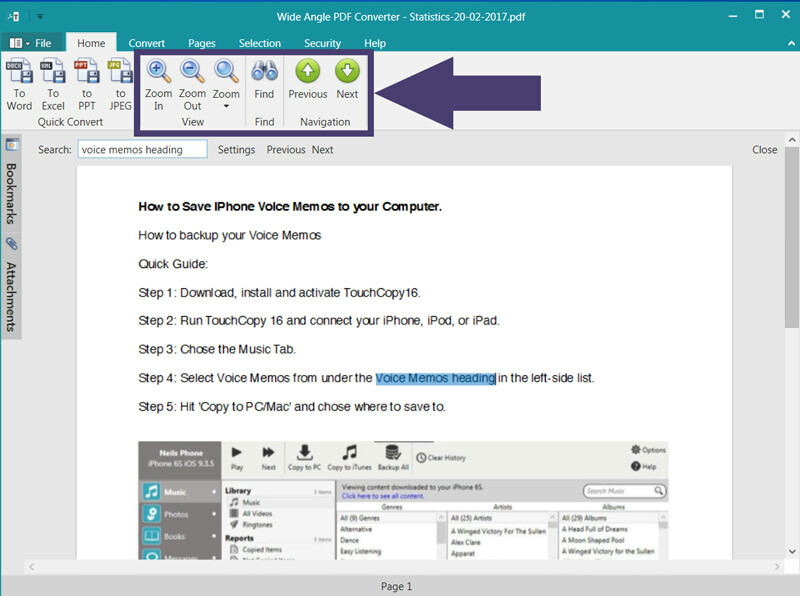 Find specific words or phrases in your PDF document by using the Find function on the Home tab. Zoom in to take a closer look at your PDF using the Zoom function. To make navigation that much easier in large PDF documents, you have the ability to add bookmarks. 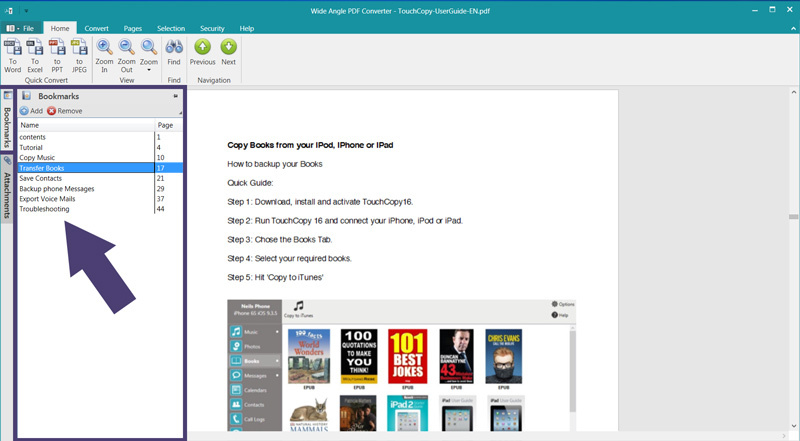 With bookmarks set, you can jump to a specific bookmarked page at any time! To do this, scroll to a page which you'd like to bookmark, then click the Bookmarks box, pinned to the left-hand side of the PDF Converter window. From here, you can create a name for your bookmark, so that you can easily remember what is on this bookmarked page. Once you're happy with the name, click Add. With bookmarks set, simply click the bookmark from the Bookmark menu box from anywhere in your document, to jump straight to the bookmarked page. Another cool feature in PDF Converter is the ability to attach files to your document. 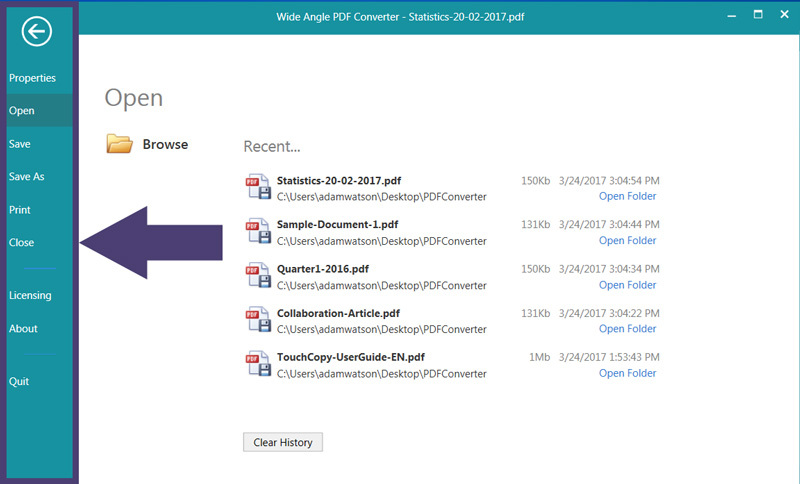 An attached file will not be added to your document view in PDF Converter, but it will be added to the end file produced when you perform a conversion of a PDF document. This is useful when sharing / sending converted documents to friends or colleagues, and easily send a related file in the process. To attach a file to the current PDF document, click the Attachments box, pinned to the left-hand side of the PDF Converter window. From here, click Add, and locate the file which you would like to attach. Once selected, press Open to add the file. If you have received a document with an attached file, you can export the attachment by going to the same Attachments box, clicking the attachment, and clicking Export.